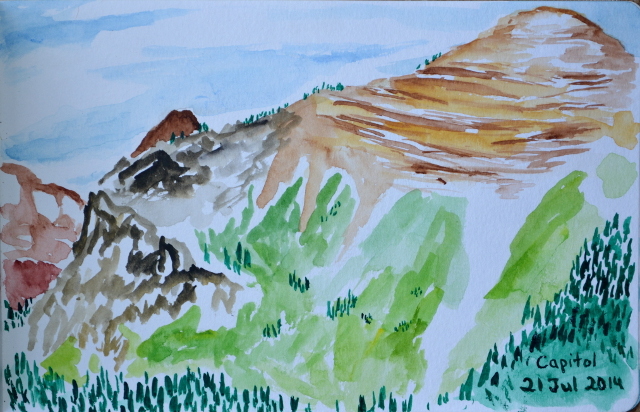 Somehow all my sketches seem to have been on backpacking trips this month. Sitting at the edge of the creek at the end of the day after going up Cloudripper. Sitting at the edge of a meadow stinking with cow but quite lovely on the way up Capitol Creek. The morning sun on the Devil's Rockpile over Geneva Lake. At Snowmass lake taking in the 14er Snowmass Mountain that sits way back behind it. It is a moody morning sky over the desert although the radio is only claiming a 20% chance of rain, and that for the afternoon. It is hard to resist the temptation to explore just a little bit in the area, even if it is down a canyon known for getting better and better as one travels down it. I have enough water tucked away in the car for a few miles of desert hiking. 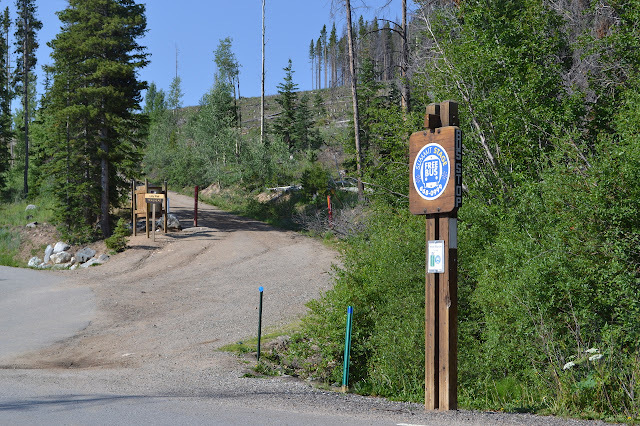 From this trailhead, there is a day use fee of $6 per person and dog. The trail, such as it is, simply follows the river bed down. Before getting down into the canyon, another sign reminds travelers that flash floods are extremely dangerous in the area. Eroded cliffs on the other side of the highway from a BLM information sign at the start of the road into White House. (Day 4 and final.) It rained off and on during the night and at one time I woke to a jackrabbit testing my bivy for edibility. Yesterday's short day made sense yesterday, but seemed less sensible in the evening, and not just because of the rubber eating jackrabbit. Besides the teeth marks in my hiking stick handle, he has done no damage. It is just that I do not see where to camp tonight and it would only be a slightly long day to finish if I had walked a little further yesterday. I decide to hike out anyway and get up with the breaking light. There is a pause in the rain with more threatening, so it seems like a very good time to pack up and try to get my bivy dry. My little roof is sufficiently under a tree that it is already dry after the light rain. A pile of sticks in the middle of the water makes me think there may be beaver in the area. A broken dam leaves another suspicious pile of sticks on land. Day 3. Another dry night and the bench for sunset watching is now a bench for the sunrise. The same mountains are fringed with light from the new sun as glowed red the evening before. 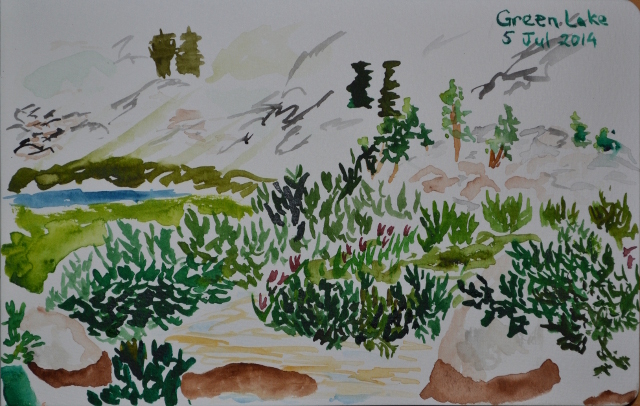 I have decided to have a short day after two 12 mile days, so there is time to paint in the morning. A couple people come up from the other sites for the water that runs past mine. They think it is a spring, but I am suspicious it is just an underground outlet for Snowfield Lake above. I watched a couple waterfalls tumble a few tens of feet and disappear into the rocks without even a splash in the Avalanche drainage yesterday. The water reappears eventually below, but it is not a spring. It is a little late by the time I get started and promptly lose the trail at the creek crossing. Geneva Lake in mid-morning, still with a few fish jumping, from the spur to site 4. 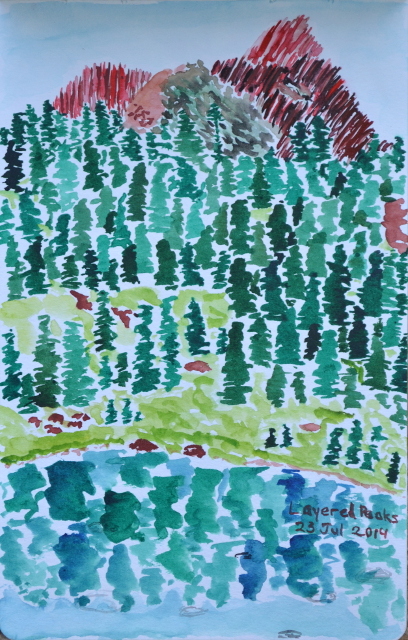 Willows above the lake extend to a row of pines and then everything gets rocky. Day 2. The clear night skies stayed that way overnight even though I did not trust them to. Having breakfast and almost packed up, my neighbor comes over to make sure I have everything I need again. 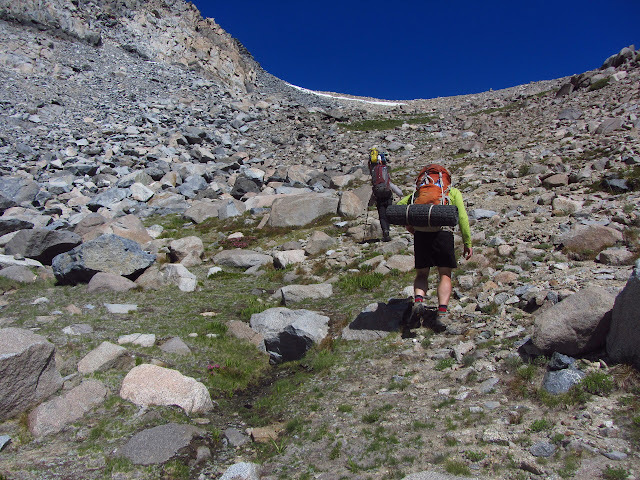 He was planning to follow my route for a while, then take a trail to the west and cut back over an unmaintained trail that is rumored to remain passable over Avalanche Pass before joining with the current trail again. 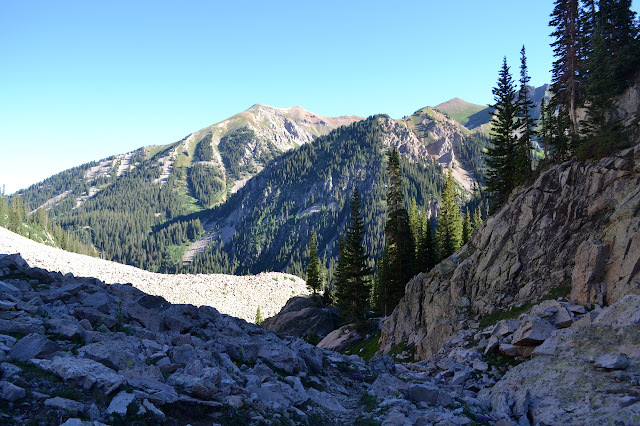 He has had second thoughts about the unmaintained trail and will instead continue down this trail and climb back up Hell Roaring to a trailhead a little more than a mile down the road from Capitol Ditch and Creek. There are many loops possible in this area. It is probably odd to feel a sense of loss because so much of trail maintenance is the feet passing over it and now this trail will get one less set, but I do feel it. When breakfast is done, the last of the gear packed up, and the half mile walked back to the junction, I begin the task of figuring out exactly where this trail goes. The sign says to look behind you. 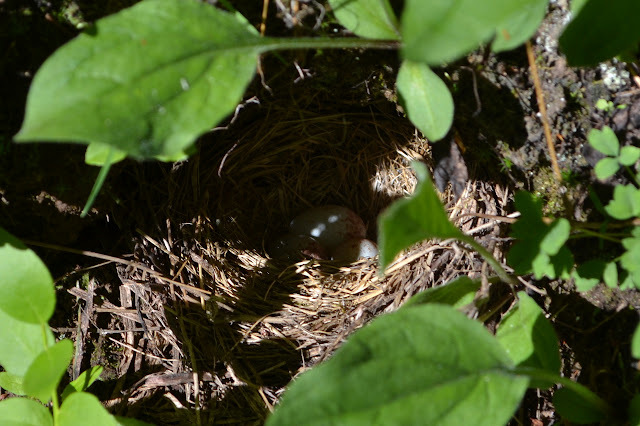 Yesterday, I finally found it dropping down and to the left to the creek to cross. The plants are wet and lean over the trail well to give my legs a good soaking. The creek is wide and a few of the rocks are a stretch, but it is just a rock hop to cross. On the other side, the trail is a bit more distinct through a bit of mud and a trickle of a stream. Cut trees and water bars show I managed the first 50 feet just fine. I then try to lose it in some willows beside a slightly larger stream. For the most part, the trail is clear, even as it passes by large cairns around the edge of a meadow. Just get up above the willows and the trail is nice and clear. 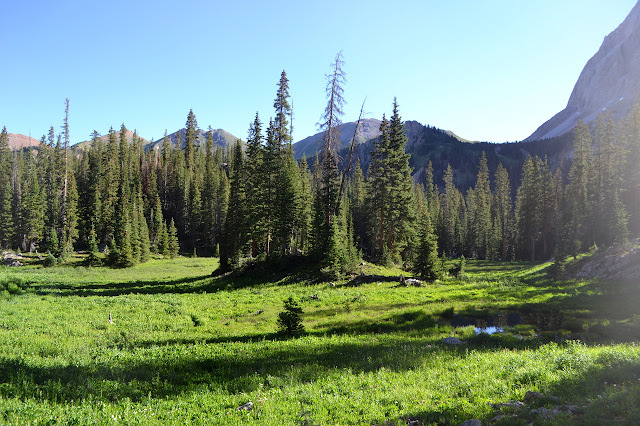 Meadows often hide a trail, but keeping to the edge makes it better. I never would have noticed these except the parent shot out of the hole in the ground just before I got to it. 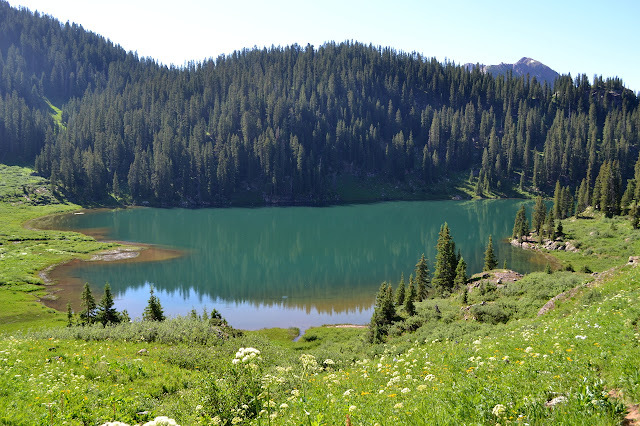 I wanted a backpacking trip for while I was in Colorado, so I asked the internet and came up with this page of "backpacking" hikes. With one loop not quite 8 miles long, it does run a bit short, but the longest loop (second down) looked interesting and would be convent to my location, so I bought the map. Since the last "40 mile, 5 day" loop was so far off, I had to measure it out for myself. My estimate was 43 miles and I expect that to be an underestimate, but it is still well within a 5 day trip. I packed as if for the Sierras, since they are big mountains at the same latitude. Also, being in Breckenridge for nearly a week beforehand should give me a good feel for the likely weather. It could be arrogant, but it seemed reasonable. Rain gear a must since big mountains will make their own weather and are prone to throwing down the drops. With that, planning complete. 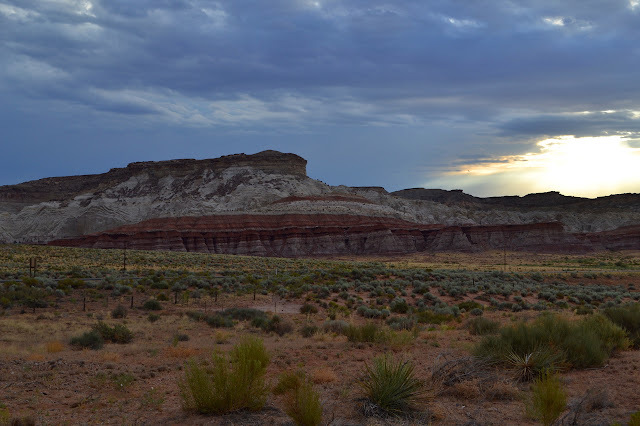 I camped out the night before at the Hay Park Trailhead on BLM land, just two miles from the capitol Creek Trailhead. The road is pretty good to this point. One mile up the road, I find that my determination not to walk those two miles of road is vastly outweighed by the foolishness that would be displayed by attempting to drive a vehicle with 6" of clearance and a touch of a nose over the huge holes and large rocks of the single lane road up ahead. It takes a few minutes to figure out how to get turned around in front of the cattle guard at the edge of the forest. A chat with the horsemen saddling up a dozen horses with equipment out of the derelict trailer in the lot at Hay Park tells me I did not miss the trail and I will not be getting there in that. It is a dreary hike up the road to the parking lot and kiosk and wilderness permits (required, but enforcement is rumored to be education) that mark the trailhead. I miss all this because I am so determined to get off the road that I grab the first trail down, the old track that bypasses all that. This dumps me over the side of the ridge and out into a stunning view that is nothing like the road up. 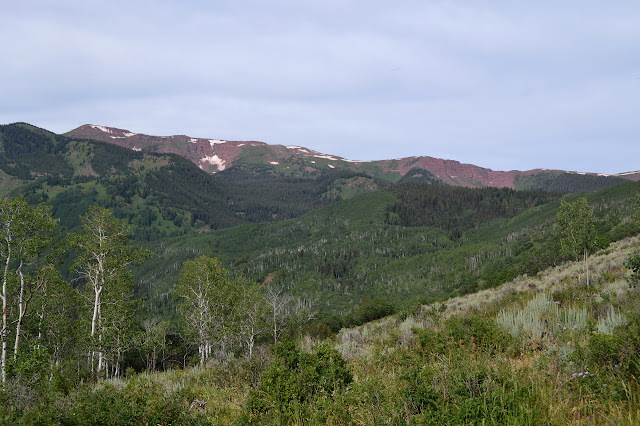 Deep red layered rocks greet me as I come out of the trees and contrast with the forests below. It is not dreary. 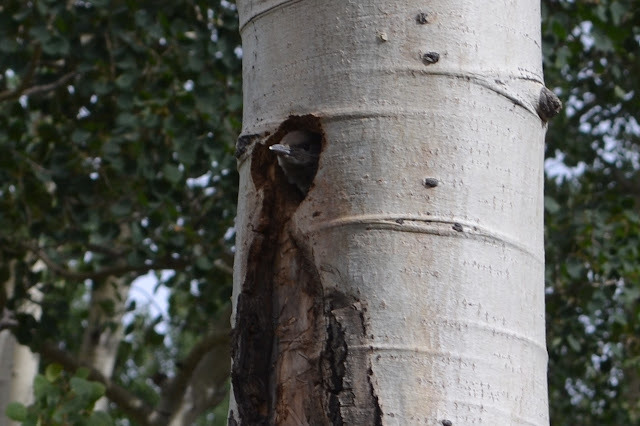 Loud demands for food draw my attention to the baby bird in a hole in a tree. Capitol Creek from above. 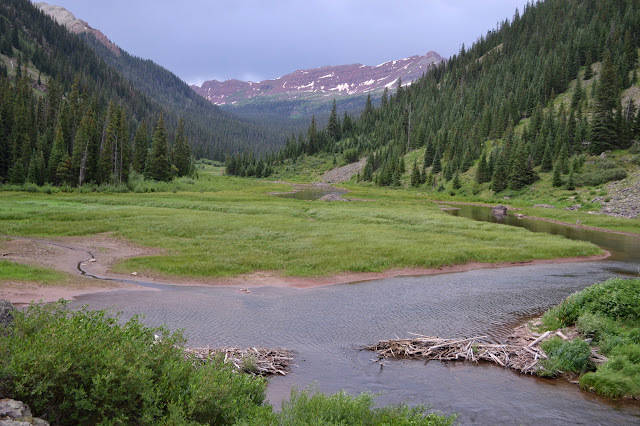 The creek runs from near Capitol Peak in the upper left and continues to the left from here. I am told it was not the case a couple days ago, but today is hot in Golden, Colorado. We will hike up from the highway to the top of Lookout Mountain where Buffalo Bill is buried to reassure ourselves that he is, indeed, dead. 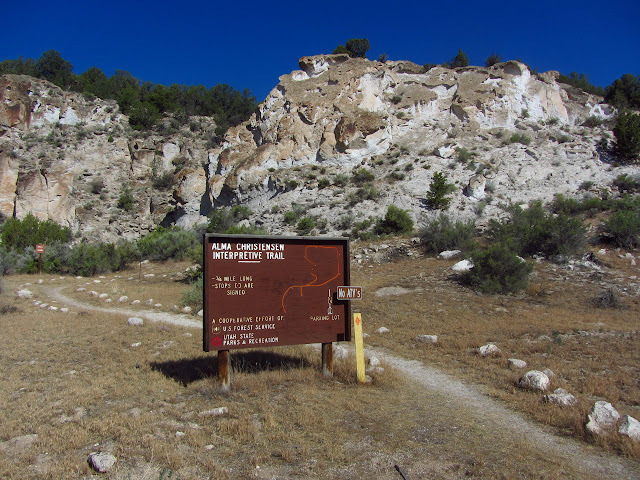 The hike is a popular one that starts at the edge of highway 6 and climbs through a semi-familiar landscape of sages and, higher up, pines. Garth, who has been hiking barefoot some recently, points out the three cacti that can make that miserable. One is the prickly pear that is so common everywhere, including at home. Some of the familiar is not so much so upon closer inspection. These hillsides seem to be covered in Matilija poppies, but it is more likely that they are crested prickly poppy (Argemone polyanthemos), which also has the big, crinkled, white petals. 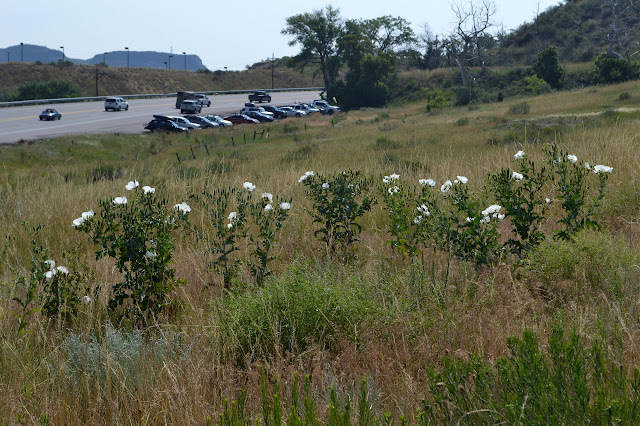 A selection of prickly poppy on the hillside just along one of the parking areas on the side of the highway. 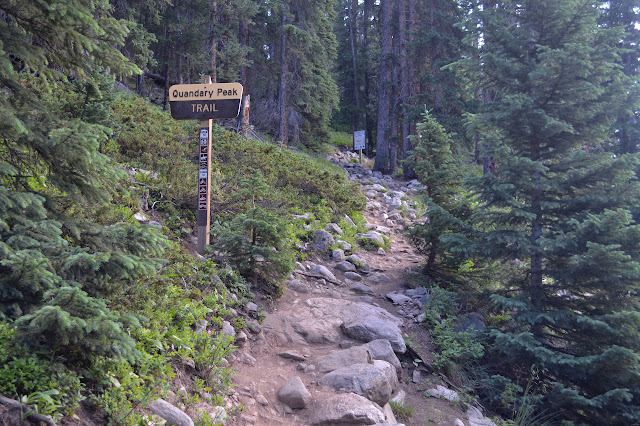 The trail climbs along Chimney Gulch. The bottom part is dry and indistinct, full of grasses and the large flowers. 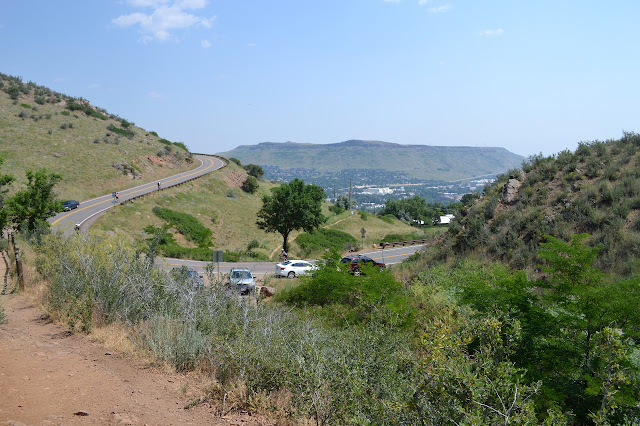 This becomes a more defined canyon as it goes up, especially after the first crossing of the road up Lookout Mountain, and even has a small stream running in the bottom. The sages smell downright odd. There are a few oaks that combine familiar features of different trees. Lookout Mountain Road snakes up a similar path. Mountain bikes frequent the trail and road bikes are common on the road. I want to be in the Denver area in the evening, but until then, I can enjoy most of the day hiking. 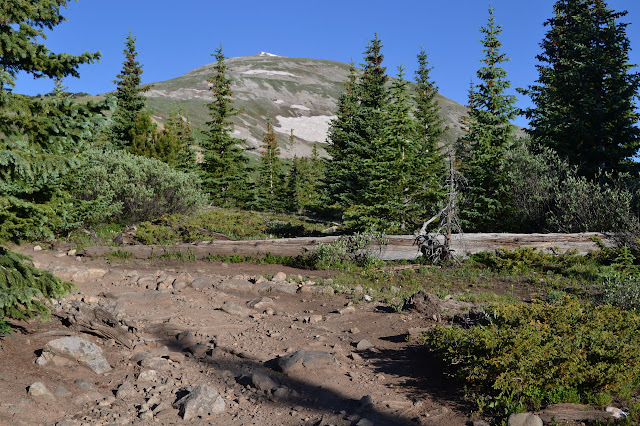 Two trailheads leave off from the road near each other to circle around the 12,777 foot peak of Buffalo Mountain via an 11,900 foot pass at the far end. Taking the loop clockwise allows the option of heading up to the top of the peak at the end if there is time. The total length is just under 12 miles, if I believe the map mileages that are often a little short. (Actual length: 14 miles.) The spur up the mountain is 2.1 miles. Arriving at the parking, the two trailheads turn out to be on either side of it. There is even a stop for the Summit Stage, the free bus service that Summit County runs. The start of Lily Pad Trail. 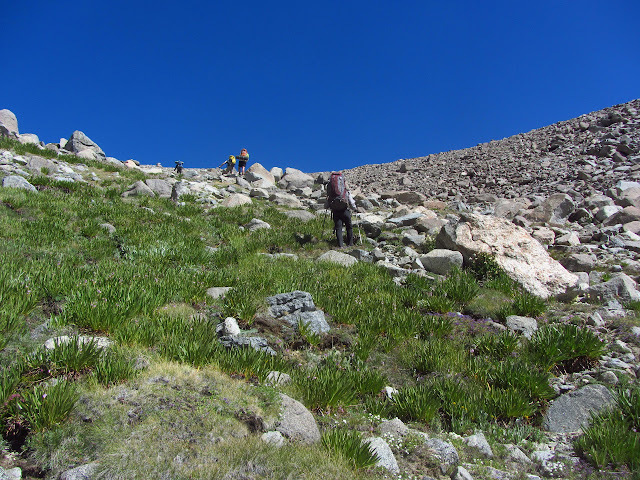 The Summit Stage provides opportunities for one way hikes as it stops by many trailheads. The trail starts off on a wide roads next to some houses, but soon comes to some utility infrastructure and shrinks to the usual dimensions for a well traveled route. The trees have been clear cut and removed near the houses. This too shall pass quickly. None of the trees seem to be wider than six inches and looking up, quite a few seem to be dead. These give way to somewhat healthier looking, but still quite young, forest with more patches of close growing and often dead skinny trees. 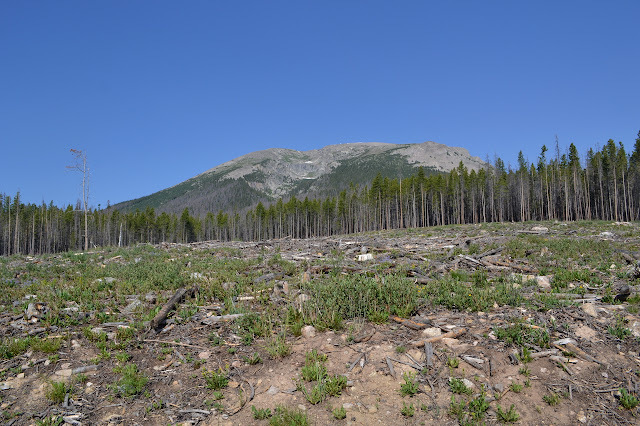 A first look at Buffalo Mountain across the defensible space clear cut of young trees. 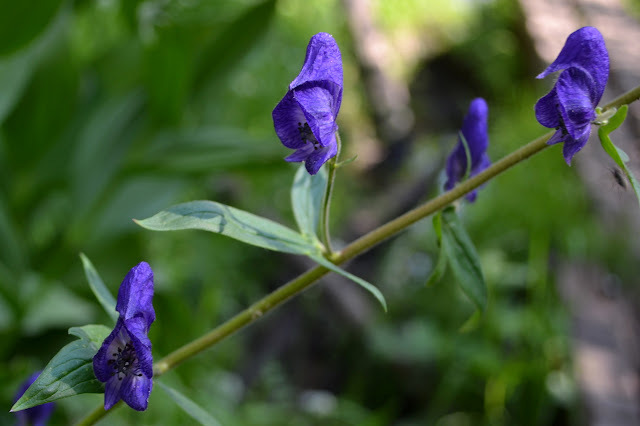 A few of the multitude of unfamiliar and familiar wildflowers. 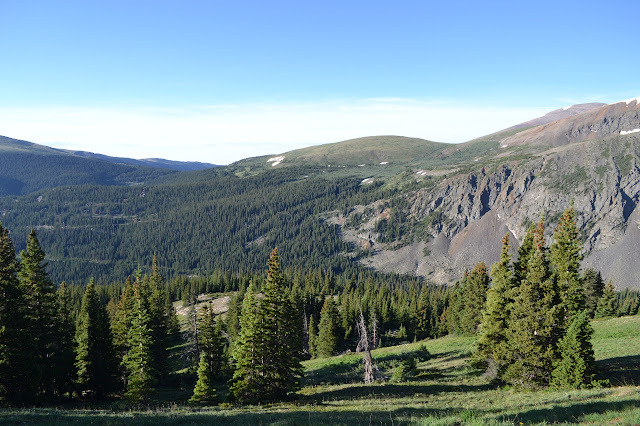 With the morning free to "look around" and having noticed that there is a 14k mountain a few miles from where I am staying in Breckenridge, I had to check it out. 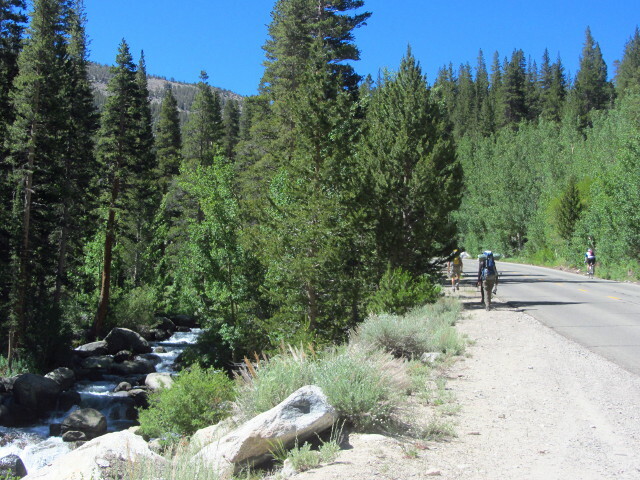 There are a number of routes, but the most common is a trail just 3.3 miles in length that starts at 11,000 feet. There was a moment where I realized that although I have been up a 14er twice, it was in the first half of my life. Williamson (14k) became Cloudripper (13k) when the permit did not work out. It is well past time for another. The car seemed to have a bad time of it over the 10,666 foot pass, but seems to have acclimated a bit just like me. Or it might be the lower gears used when not driving the interstate. At 6:30AM, there are more than half a dozen cars already parked at the trailhead on the county road (851), but still good parking out of the way of traffic remains. There is also a big lot just off the highway on 850 that does not add more than a couple tenths of a mile to the hike and seems to be used much less than it ought to be. The sign at the bottom of the trail as it leaves county road 851. A sign on the trail just after the one saying which trail it is points out that there are no easy 14ers. Between the thin air and the ability of big mountains to make their own weather, it can take longer than expected and quickly become more dangerous than expected. Today, the afternoon thunder storms are expected to start up a bit early, maybe 11AM. There are thick trees initially. None of the trees seem to be very old. The trees thin quickly with the climb. Many seem to have bunched up fibers collecting on them although the usual suspects for dropping such things do not seem to be growing nearby. Some maps record a few other trailheads and some old roadways come up to meet the trail, but none seem to be in use and it looks like there is a standardization on the signed trailhead for the least disturbance of private property in the area. A first look at the peak up ahead. The fingers of civilization reaching into the mountains become visible as I get higher. Roads twist around the mountain on the other side of the valley with houses far separated along them. A little higher and the reservoir becomes visible. Other than the reservoir, the development seems to stay in the trees. A few cars are parked near it, possibly for the more challenging but shorter climb up the mountain. I pass a few hikers on the trail including one set that looks like a man in his 70s helping his father up the trail. The younger man seems quite capable of doing the trail himself. The older man is very slow and seems not entirely aware, but very determined. The younger man is hyper-aware and resolute. Looking down as the trees thin to meadows, there are many roads and houses tucked into the trees below. I picked a random spot along the road to go geocaching to stretch my legs and break up driving to Colorado, which turned out to be a nice little stretch of old highway now bypassed by Interstate 70 in Utah. The first cache was placed next to a pair of right-of-way markers for the road, which was fun to find. Another had me parking near another benchmark and climbing up a short way along an old road. Coming down again, I noticed them scattered over the hillside thick with the fragrance of sage and blooming with all their might: Matilija poppies. 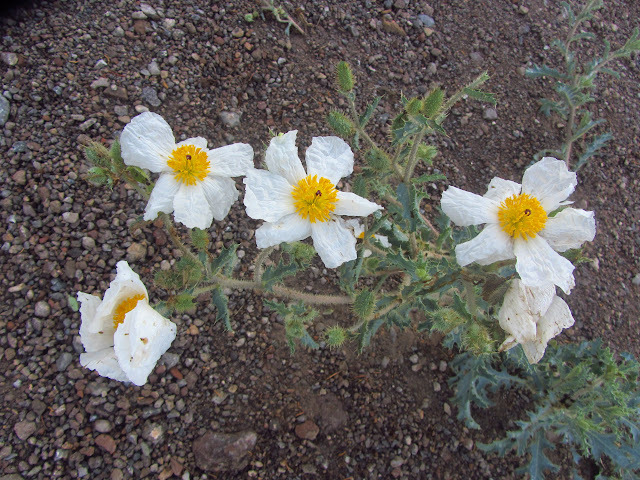 Along a bit of old Utah state road there are Matilija poppies growing. After the rather surprising flowers, I found a nice trail I wanted to go down, but had no idea how far would go, and then some road construction. The pilot car for it decided it needed to lead everyone past my turn and then past a couple little trails and I decided to go for one since I was still wanting a little more walking about and was not figuring out why it kept going. A horse trailer already occupied the little turn around parking lot. This trail is very clear about how long it is, just 3/4 of a mile. It also proclaims itself to be an interpretive trail but there is no box for the brochure. The prepared can find the content of the brochure that was once available at the Fremont Indian State Park visitor center reproduced here. I cannot count myself among the prepared, so will simply have to wonder at each number. Starting off on the Alma Christensen Interpretive Trail. The night cleared up from time to time, but the morning is changing quickly, clouding over and clearing up. There are a few more drops, but it is hard to notice them. There is nothing left but the short hike out and the long drive home, so we are reluctant to get up. On the other hand, the weather is threatening, so there is motivation to get packed up. The weather may be churning above, but below it is still on Green Lake in the morning. The downright pleasant night at Thunder and Lightning Lake turns into an even more pleasant morning as the sun crests over, from our perspective, low hills. We are slow to get up because while we have decided how we will go after the mountain again, we have not decided if. We got close to it and saw it and saw views like what it should have, maybe there is something else interesting around. But really, what else are we going to do? It is just too nice a day not to and we are so close. 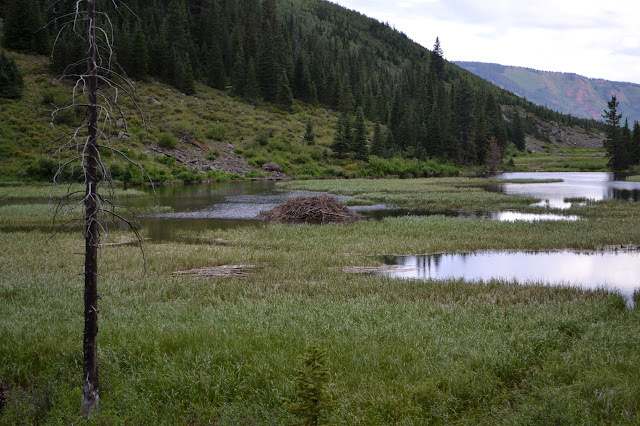 Once settled, it is not long before we are packed up and starting up the inlet area of the lake to reach the flat above. 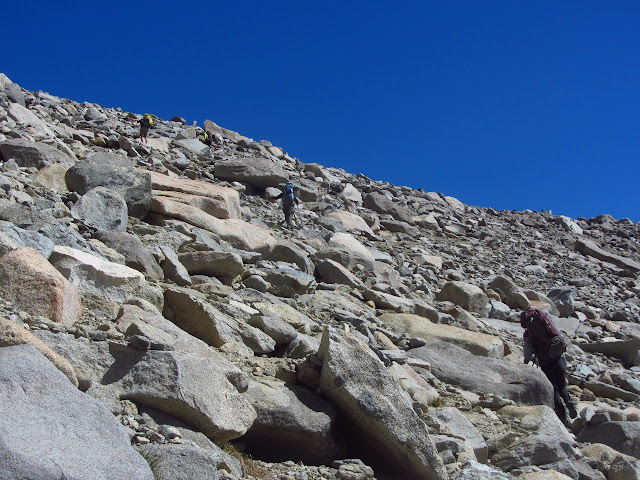 It looks like there are a couple tough spots, but we do not find them as we climb. 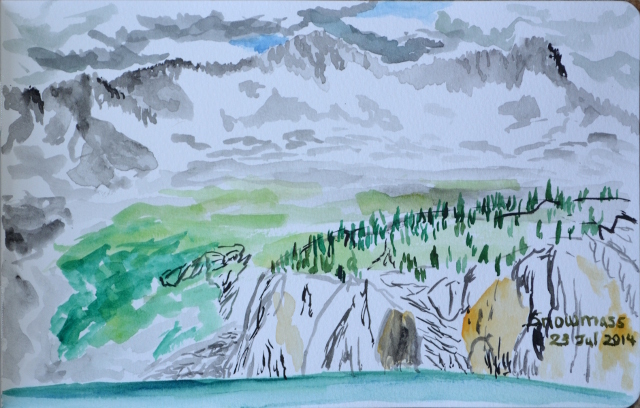 Bernard, Linda, Menzo, and Bhagwan climbing up and out of Thunder and Lightning Lake near the inlet. Bhagwan still leads us heading up to the flat above the lake. The climb was a lot easier than expected. The night above 11,000 feet probably helped as did the good sleep. I feel silly for thinking we might be better off making our way along the flat area around the lake (that is not a trail by any means) and using the better established trail over there to drop down and then climb back up. It would have been a very long detour. We drop the overnight items and start up Vagabond directly. There is a lot of smaller, easy to climb stuff and it is almost entirely and easy, if steep, walk up. We eventually aim at a little chute that comes off the peak and top out just 30 feet from the register we signed yesterday. It is definitely a better route up Vagabond. Bhagwan has dropped back a bit and now Menzo, who is supposed to be our leader, is leading. There is big stuff on the left and little stuff on the right. Bernard is getting ahead of the leader because he is keeping more to the easier right. 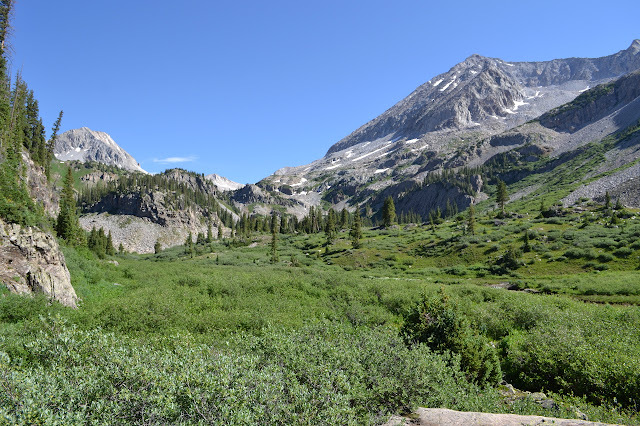 We set off to Bishop on a quest to bag Cloudripper, the tallest peak in the Inconsolable Range, a small subrange of the Sierra Nevada Mountains. This can actually be done as a day hike, but we have three days to make the peak, and then, well, whatever. 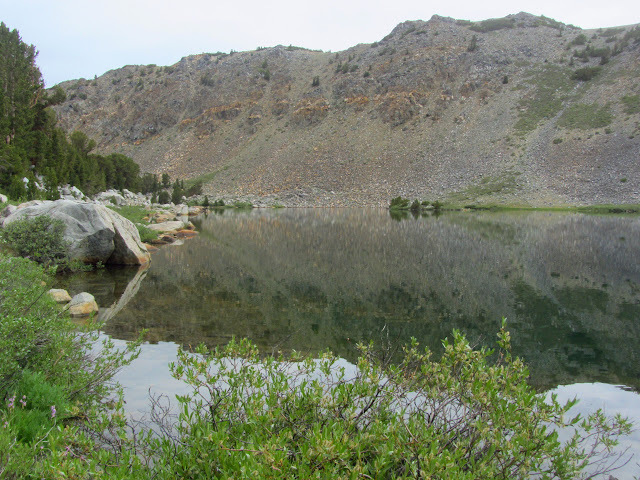 I heard that and started looking around and thinking, oh we can hit The Hunchback (or Coyote Ridge) and Vagabond (not actually named on the USGS maps) on the way up, and then there is supposed to be a fairly easy way down int Seven Lakes for the night. 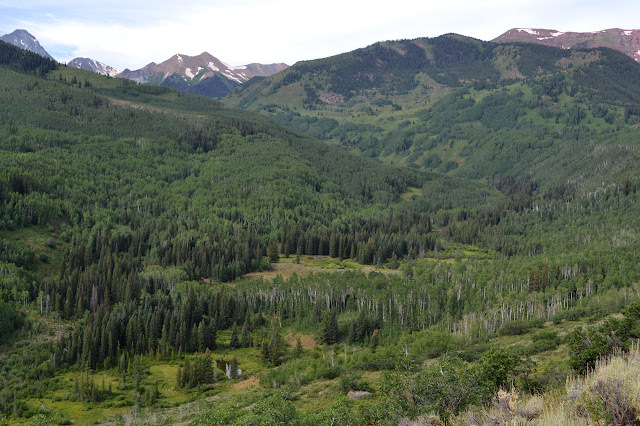 Then we might be able to follow the trail over Jigsaw Pass and maybe hit Mt. Agassiz or something and head back north along the trail to Bishop Pass for some camping by a lake. The last day could see little Chocolate Peak and maybe Mt. Hurd. Lots of mountains, it would be an epic journey of only three days! The rest were a bit more focused. After sorting out one member accidentally bringing the wrong boots (an older pair) by the purchase of a new pair, we hit the trail somewhat later than planned and there are no spots in the overnight lot by South Lake forcing us into a turnout on the road just below Parcher's Ranch. This does give us a flush toilet to use before stating, but means we start a little lower on a trail beaten up by horses. It is lined with lush meadows full of wildflowers. A little roadside walking to get the trip started. 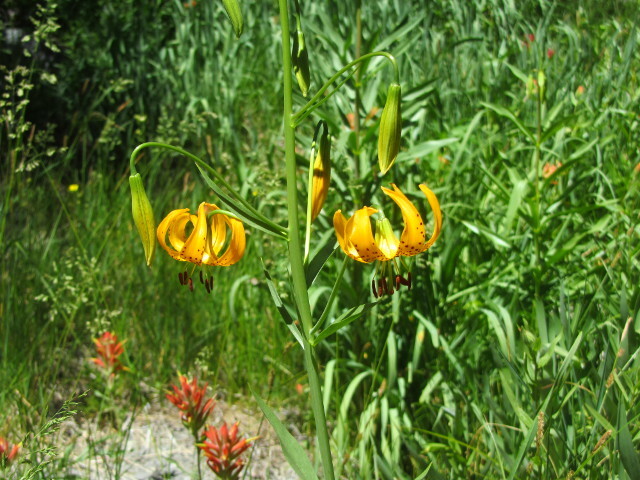 The Humboldt lilies are a quick find although these are the size of a baby fist rather than a large adult fist. They all look healthy. 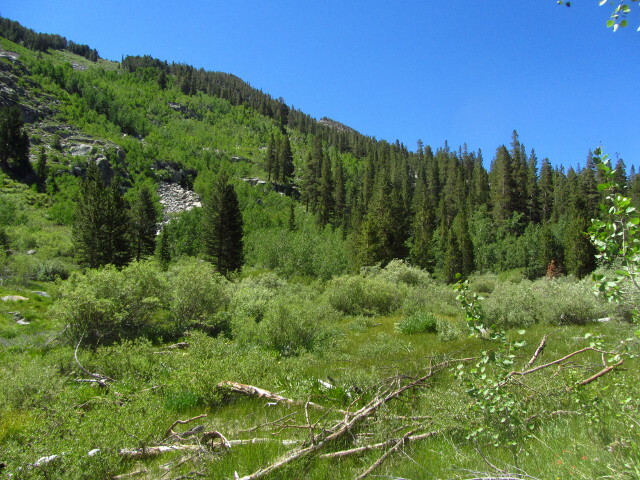 One of the more open meadows along the side of the trail.